The common image of the Confederate Army during the Civil War is dominated by a limited number of early photographs of officers and men wearing the gray and butternut associated with the CS regulations and quartermaster issues. 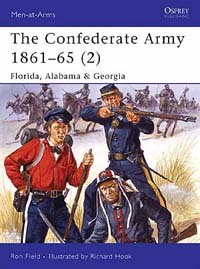 This sequence of books examines a much wider field: the original uniforms of the state and volunteer companies which were brought together to form the Confederate field armies, and the continuing efforts to clothe troops as wear-and-tear gradually reduced the originally wide range of uniforms. A mass of information from contemporary documents is illustrated with rare photographs and meticulous color reconstructions.